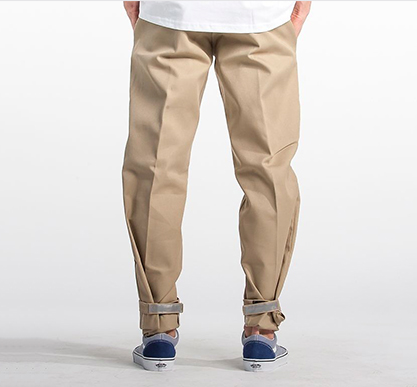 The Dickies Fixed Gear 873 Pant is a natural progression from the flat fronted work wear Dickies that have been the staple fixie trouser of choice for years. Maintaining the same durable, comfortable and practical features of the 873 slim fit whilst adding some specific extras for the bike market. The turn up now have Velcro closures to eliminate the need for cycle clips and are finished off with a reflective strip for added safety and arty photos whilst smashing through the streets on the latest alley cats race. As well as the classic woven Dickies tab there is also the nice addition of a stitched in DFG above the same pocket, stealth in it’s design in a similar coloured thread to the khaki pant. 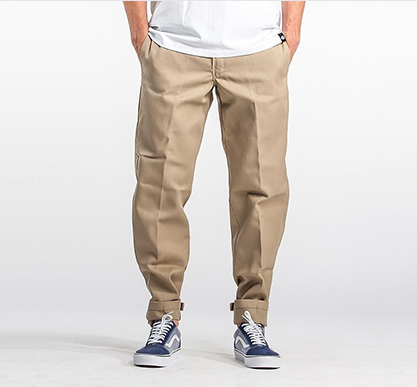 These pants carry all the quality and design you have come to know and love from Dickies whilst being perfectly tailored to life on the bike.